Brace yourself as two of the UK’s premier Trance Promoters join forces for the very first time to present the ONLY FSOE 450 event in Europe for 2016. On Saturday 1st October 2016, at one of the Manchester's premier & unique event spaces, the bar for UK Trance events will be raised as Goodgreef & Rong collaborate to host one of highest profile concepts in international Trance Music. 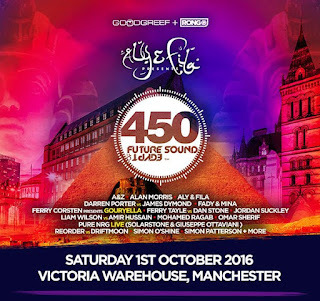 After the huge success of the Future Sound of Egypt 350 events in 2014, Aly & Fila celebrated reaching the 400th episode of their weekly radio show by hosting eight global parties. Over 40 international DJs/Producers played at the events in Egypt, USA, Australia, Poland, Argentina, Guatemala, Mexico and Belarus . Aly & Fila made history during this tour by becoming the first ever electronic music artists to perform at the Great Pyramids of Giza in Egypt. With the unique stage productions and visuals catching the elements of ancient Egypt, the Future Sound of Egypt 400 world tour was a unique clubbing experience for tens of thousands worldwide. Are you ready for the next level? The next milestone will be celebrating the 450th episode during the Summer of 2016. Aly & Fila are on a roll and are more than ready to embark on an even bigger journey around the globe! This will be a show that is set to leave a firm and fixated message that Trance is well and truly alive and its home in the United Kingdom is Manchester. The UK's largest #Trance event of 2016. 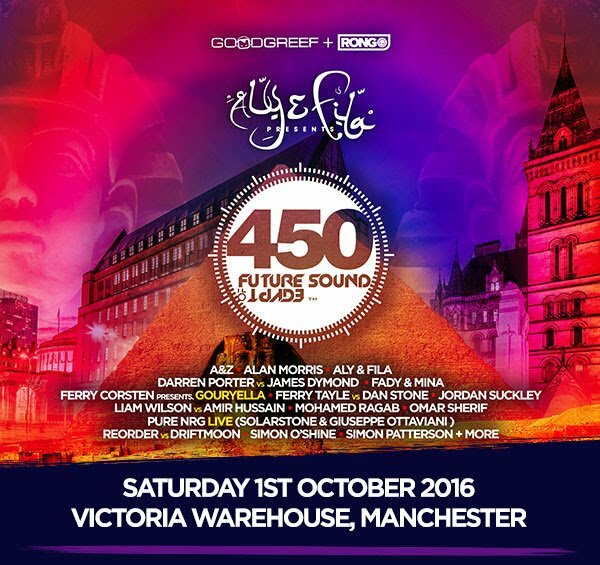 The official FSOE 450 UK Pre Party will be held at Ark, Deansgate Locks, Manchester. 2pm-6.30pm. 1Mix Radio. Awesome Inc. theme. Powered by Blogger.